Sunshowers is part of the Green Bank Summer Collection. The collection is great value for money compared with buying the individual patterns. 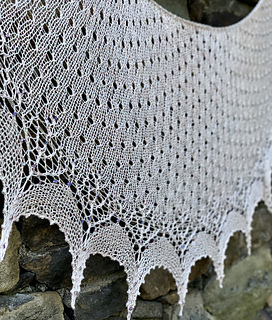 For those of you who have knit my shawl pattern Rainshine, you will know that we are very much a ‘glass half-full’ family, we look on the bright side of life, and have always called the shafts of light through dark clouds ‘Angel’s Fingers’ or ‘Rainshine’. We also have our own name for those unexpected rain storms that happen in the summer – those wonderful downpours that clear the air and are gone as quickly as they came – Sunshowers! 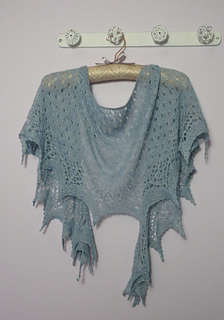 Sunshowers is a pretty crescent shaped shawl that is totally addictive. Worked from the top down it has a repeatable body chart and is finished with a pretty lace pattern and a shaped garter stitch edge. 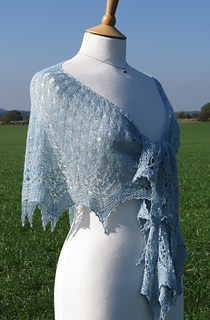 It works beautifully as a little shoulder shawl, doubles as a scarf, can be worn middle at front and dangles at the sides, can be worn around the hips … How will you wear yours and what will you knit yours in? 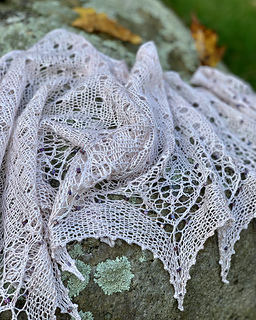 Sunshowers is a relaxed and comfortable shawl that can be knit in almost any yarn and is brilliant for those beautiful alpaca blends as it doesn’t need to hold a firm block. It is written as a one size shawl but is easily adaptable as the main body pattern can be repeated.